Mike says that he won't go and see his mother who's been critically injured in a plane crash. Toby and Lochy have been attacked by a magpie so have retreated indoors. Joe suggests that they stay indoors today so they start colouring at the kitchen table. Des and Jamie are playing with a toy car while Mike stomps around the house silently. Des tells Mike to think about going to see his mother - it might be his last chance. Des agrees his mother has been uncaring and practically the worst mother in the world, but she's still his mother. Mike erupts and says he doesn't want to make peace with his mother - it's too late for them. 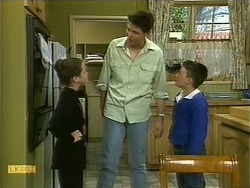 Jim comes up and asks Joe if he can borrow his video camera to get the new family on tape. Helen gets a phonecall to tell her that her friend Susan has died of a heart attack. Helen is very shocked - Susan was always so fit and well. Beverly sympathises with her. Jim comes in bubbling with excitement about the video camera. Beverly thinks it's a great idea and goes off to dress Rhys in his new suit. While Beverly is in the bedroom, Helen tells Jim about Susan's death - she's particularly shocked because she was the same age as Helen. Jim starts to show Helen how to use the video camera to take her mind off things. Gloria arrives home on foot and tells Paul that she's lost the keys. Paul is exasperated - all the keys to the complex and his Lassiter's ID badge was on it. Anyone finding them could use them to rip off Paul's business and his house. Toby and Lochy are fed up of hanging out inside because of the magpie. Kerry makes them helmets out of icecream cartons but they are less than impressed! Des is still trying to persuade Mike to go to Perth to see his mother. Mike tells Des to stop pushing him and shouts at him to drop the subject. 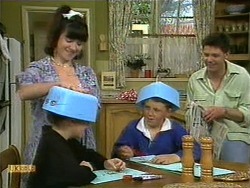 Kerry comes in with an icecream carton on her head to warn them about the magpie. She senses the tense atmosphere and Mike reluctantly tells her what's happened. 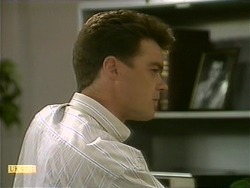 Kerry tells Mike that he MUST go to see his mother for his own sake. Kerry tells him that she made peace with her own mother in the last few weeks of her life. She says if she hadn't she'd never have forgiven herself. Mike must do the same. Paul is ranting on the telephone to his duty manager about the missing keys, telling him to mount surveillance at all the doors to the hotel. Paul has also called a locksmith to change all the locks at the house. Gloria keeps apologising profusely. Jim is filming Helen for practice, much to her exasperation. Helen has a go at filming herself and Jim explains that it's automatic focus. Helen has a go at filming Rhys but her hands are shaking too much. She goes off to water the garden. Lochy and Toby are in the garden. Toby is safe under his icecream carton helmet, but Lochy won't wear hers and gets attacked by the magpie! Mike has reluctantly rung the hospital to check on his mother's condition. He's rethought his position and will get a flight after all. Des thinks Mike has made the right decision. Mike thanks Des for helping him with the decision and says that he's lucky to have such a good friend. Paul tells Gloria to stop apologising about the keys, but he'll have to get all the locks changed. He's already had the house locks changed. Just then, Gloria finds the keys in the bottom of the grocery box. Paul is very annoyed and shouts at Gloria about her stupidty. 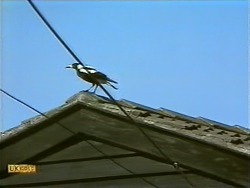 Toby tells Joe and Kerry that Lochy is outside trying to knock the magpie out of its tree. 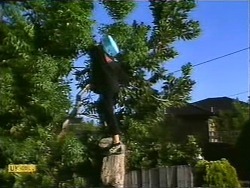 Lochy is climbing a tree and Kerry calls at her to stop. She loses her balance and falls.